Fans will get the chance to meet Metro Manila Film Festival’s two-time best actor, Dingdong Dantes at the meet-and-greet session hosted by ABS-CBN Publishing for gracing this month’s StarStudio Magazine. The event will be held on Sunday (March 17), 2:00 p.m. at the National Bookstore in Glorietta 1. 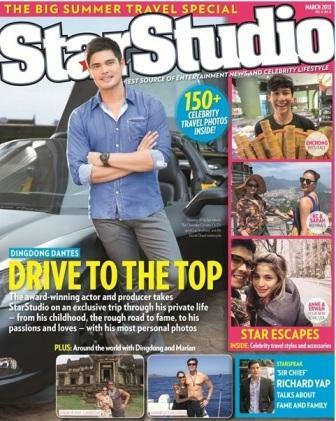 To register, readers must purchase a copy of the StarStudio Magazine March issue with Dingdong Dantes on the cover. The March issue of StarStudio magazine features Dingdong’s never before seen photos of him and girlfriend Marian Rivera during their trips to Barcelona, Spain, Angkor Wat and Amanpulo, Palawan. He also shows the latest addition to his collection of vehicles: a Chevrolet Corvette and the Ducati Diavel, which were presents from Marian. Also inside StarStudio’s Big Summer Travel Special are photos of some of today’s hottest Kapamilya stars in some of the world’s most popular tourist destinations.